Most of the software deployments I have worked on are using Linux servers. When running software on Linux, it’s important to have an understanding on various tools available to check how the system behaves. 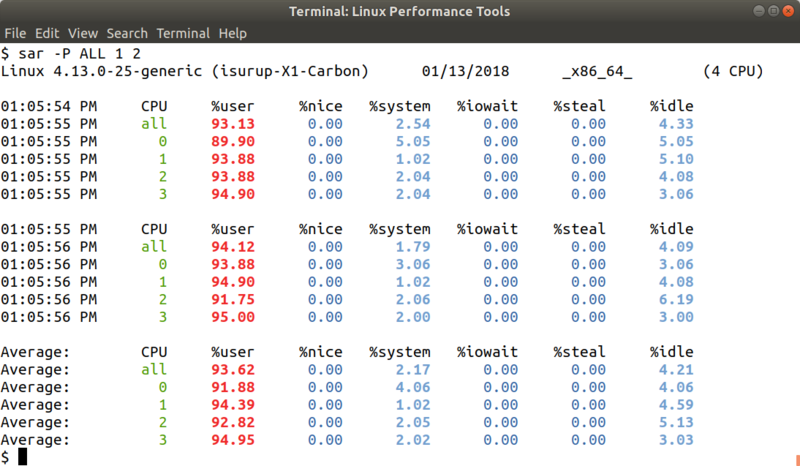 There are many Linux commands available to analyze the performance of a server. This article focuses on the tools available to observe the system activity. There are tools to measure activity in various components of the system, such as Operating System, CPU, Memory, I/O etc. 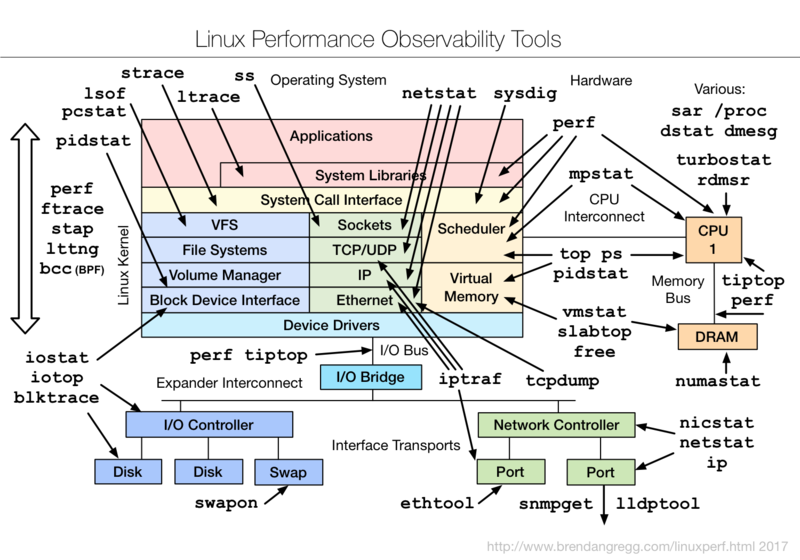 Brendan Gregg, who is a computer performance analyst, calls these tools as “Linux Performance Observability Tools”. Each of these tools has very detailed manual pages. It’s highly recommended to have a look at the manual pages for more information on the commands. Please note that most of the descriptions for the columns in this article are taken directly from the manual pages. This story is also meant to be a quick reference and it’s easy since all details are in one place. The information copied from manual pages are formatted in italic text within quotation marks. Let’s look at some of the standard Linux tools in detail. I will not be covering all tools mentioned in Brendan Gregg’s presentation on Linux Performance Tools. Please note that I have tested all commands in Ubuntu 17.10. I changed the command prompt and title using following command. The command “uptime” prints the system up time with load averages. It also shows the current time and number of user logged in. The system load average is a good way to measure the demand for CPU resources. There are 3 numbers and those numbers represent the load average over the last minute, the last 5 minutes and the last 15 minutes. With these 3 numbers, we can determine the server load is increasing or decreasing over time. It’s important to check that the load average will not go beyond the number of processors in the system. There are several ways to find the number of processors. The “lscpu” command is a quick way to get details about the CPU architecture and see the number of CPUs. The “nproc” command prints the number of processing units available in the system. If the load average is greater than the number of processors, there is more demand for resources and we need to identify which processes use more resources. The “top” command is used to display the system tasks. The top programs provides a limited interactive interface and the screen refreshes every 3 seconds by default. This delay time can be configured by pressing “d”. Since the screen refreshes periodically, the top can miss short-lived processes. When you run the “top”, you can see following sections: 1) Summary Area; 2) Fields/Columns Header; 3) Task Area. CPU state percentages are based on the interval since last refresh. %CPU (CPU Usage): “The task’s share of the elapsed CPU time since the last screen update, expressed as a percentage of total CPU time.” Please note that the top shows CPU usage from all processors. So, the %CPU can go over 100%. For example, the if there are two processors, the top can show %CPU upto 200%. The “htop” command is also a good interactive process viewer. It’s not available by default and you will have to install the “htop” package. What is ‘Nice’ in Linux? In “top” and most of other Linux tools, we see a “Nice” value and it’s the CPU scheduling priority. A negative nice value means higher priority and a positive values means lower priority. When a process is having a high nice value, it’s nicer to other processes. With the “nice” command, we can run a program with a custom nice value. We can change the nice value with the “renice” command. Only the superuser can set a higher priority for a process. The changing priority will be useful in many cases. One example is running a long background process with a high nice value (lower priority) is good to allow more CPU time for other processes. The “ps” command displays the active processes in the system. The ps command accepts UNIX style, BSD style and GNU style long options. The default command just shows the processes for the current user and associated with current terminal. So, you need to use additional options if you want to see all active processes in the system. Following are some details on the column headers. COMMAND: The command is shown. Depending on other options, the command arguments are shown. Following are the details for the column headers. CMD: The command is shown. Depending on other options, the command arguments are shown. For more output formats and details on columns, see the Standard Format Specifiers section in the manual page of ps. The “vmstat” command reports information about processes, memory, paging, block IO, traps, disks and CPU activity. Following example uses “vmstat -SM 1”, which shows the stats in Megabytes and reports new stats every second. r: “This shows the runnable processes (running or waiting for run time)”. If this is greater than the number of CPUs, there is more demand for CPU resources. si, so: “Amount of memory swapped in from disk and swapped to disk per second”. If these values are non-zero, the system has run out of memory. bi, bo: “The number of blocks per second received from and sent to a block device”. If these values are non-zero, there is I/O activity. These values are higher if there are processes doing lot of work. These shows the percentages of total CPU time. This command may not be available by default. e.g. I installed the “sysstat” package in Ubuntu (“sudo apt install sysstat”). The iostat command gives two types of reports, the CPU Utilization report and the Device Utilization report. Both reports are shown by default. Use following options to view a specific report. When using the iostat command, following options are recommended. Following example also uses the “-m” option to display statistics in megabytes per second. See manual page of iostat for the descriptions of each column header. aqu-sz: “The average queue length of the requests that were issued to the device. 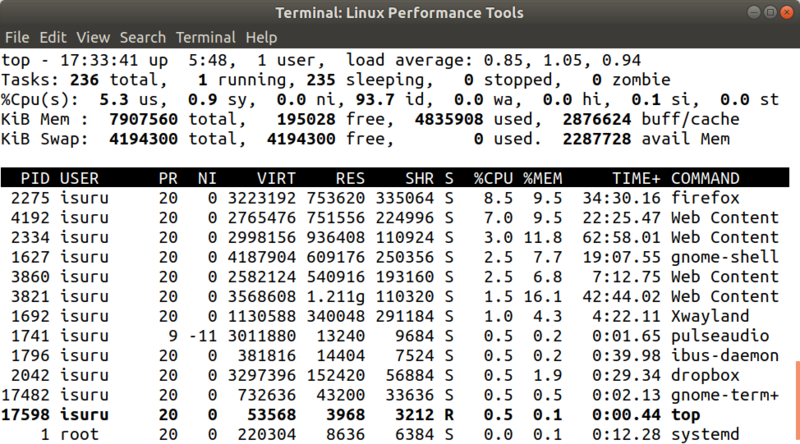 See following screenshot for the command “mpstat -P ALL 1 2”, which shows per CPU stats. Please check the manual page of mpstat for more information. We can use the mpstat command to check whether processes are using the CPU properly. There is a simple command named “free” to display the amount of free and used physical memory and swap memory in the system. This tool also shows the buffers and caches used by the kernel. The “free -m” command is the most common way of checking the free memory in megabytes. Following are the descriptions of each column. It’s important to note that you don’t have to worry about “Mem:free” memory being very less as long as there are enough memory in “Mem:available”. If there are enough memory available, the Linux system can quickly reclaim memory if processes need it. So, now you know that Linux did not eat your ram! The “Swap:” line shows the swap memory usage. If “Swap:used” is not zero, your system is swapping. If the interval parameter is not specified, the task statistics are reported for the time since the system startup. By default it shows the CPU utilization. There are other types of reports as well. Following are some options. -u: “Report CPU utilization.” This is the default report. Following are some columns to check in each report. The “nicstat” command prints the network traffic statistics. This is not available by default in Ubuntu and it can be installed with the command: “sudo apt install nicstat”. Above screenshot was taken while running a test with iperf3. Following are the descriptions for each column. Following are some types of reports you can get from nicstat. See manual page of nicstat for the output details. The “netstat” command is a very popular command to print network connections, routing tables, interface statistics, masquerade connections, and multicast memberships. By default, the netstat command displays a list of open sockets, i.e. “Active Internet connections”, “Active UNIX domain sockets” etc. We are usually interested in the “Internet Connections”, i.e. TCP & UDP. The connections without servers are shown by default. -a, — all: “Show both listening and non-listening sockets.” This shows servers and established connections. -t: Show only TCP connections. -u: Show only UDP connections. -l, — listening: “Show only listening sockets.” This shows only servers. -p, — program: “Show the PID and name of the program to which each socket belongs.” In this case, running the “netstat” command with root privileges is recommended to find out the processes and the users owning particular processes. The “netstat” command, by default tries to determine the hostname instead of showing the IP addresses and it can slow down the netstat output. Use “-n” option to avoid that. With “-n” and “-e” options, the uid will be shown instead of the username. netstat -at: Display all (servers and established) TCP connections. netstat -ant: Same as previous command, but disable hostname lookup methods for faster output. sudo netstat -antp: Same as previous command, but display the process ID and Program. sudo netstat -antpe: Same as previous command, but display the user ID. (Avoid “-n” to display the username. sudo netstat -atpe — numeric-hosts: Similar to previous command, but display username and show the IP addresses instead of hostnames. netstat -tnl: Display all servers listening on TCP. netstat -ct: Show TCP connections continuously. netstat -ie: Display detailed “Kernel Interface table”. Following are the meanings of each column. For more information on these columns and the states of socket, see the manual page of netstat. The use of “netstat” command is now deprecated and there are few replacement commands available such as “ss, ip route (for netstat-r), ip -s link (for netstat -i), ip maddr (for netstat-g)”. Following are the notes from man page. The Swap usage can be checked by the “swapon” command. It’s recommended to have swap enabled if you have less physical memory to run all your applications. The “lsof” command can be used to list the files opened by processes. By default, it shows all open files belonging to all active processes. Following are the descriptions for each columns (shown by default). For more details, refer the manual page of lsof. USER: “The user ID number or login name of the user to whom the process belongs, usually the same as reported by ps”. FD: “The File Descriptor number of the file”. It also shows some predefined values such as “cwd”, “txt”, etc. lsof -i: List all network connections. lsof -i TCP: List all TCP connections. lsof -iTCP -sTCP:ESTABLISHED: Show all active connections. The lsof options are very useful and there are many ways we can use those options to filter out what we need. For example, with “-i” option, we can filter by IP version, Protocol, hostname, port etc. The “sar” is a useful command to monitor performance of the system and it supports collecting, storing and reporting the system activity information. It’s important to note that the “sar” tool can report system activity over a period of time. The data collection must be enabled if you need historical data. The “sar” command is again a part of “sysstat” package. When you run the “sar” command, you might get a message as shown below if you have not enabled the data collection. To enable data collection, we need to set “ENABLED” property to “true” in “/etc/default/sysstat” file. You can use following command with root permission to enable SAR. By default, the activity is reported in every 10 minutes. The activity is reported by a cron job and we can edit it from the file “/etc/cron.d/sysstat”. If you edit the cron expression, you will have to restart the “sysstat” service (sudo service sysstat restart). It’s is also important to note that the activity logs will be kept only for seven days. If you want to change the number of days for the history, you can edit “/etc/sysstat/sysstat” file and change the “HISTORY” option. The “sar” command can give you a lot of details about the system covering all aspects. With the historical data, you even troubleshoot an issue happened in the past. Following are some useful options to get details in different subsystems. Each of above options produce different reports and the details of each column are available in the manual page of “sar”. NOTE: All these reports can be printed using “sar -A” command. The “ksar” is a great tool you can use to visualize all the data collected from the sar tool. See following diagram by Brendan Gregg showing all the sar report options. When we run “sar”, the report will be shown by reading the standard system activity daily data file. By default, “sar” return statistics for the current day. If you want to look statistics for a specific period, you can use “-s” and “-e” options to specify start and end times respectively. By default, the SAR reports CPU utilization. You can use above mentioned options to get reports for different subsystems. Let’s see some more example usages of sar command. Note that each command shown in examples use the interval and count. Then each command will show the real time data and it will not look for the activity log file. With “sar -u”, we can get CPU usage for all CPUs. The output is similar to “mpstat” command. This output gives the cumulative real-time CPU usage for all CPUs. In this example, the CPU is not idling much and that means the CPUs are fully utilized. Checking %idle is a good way to figure out the CPU load. The command is “sar -P ALL”. This is similar to “mpstat -P ALL”. Following are some columns to check. This is an important report to understand about server run queue and load average. See also “vmstat” command. If the run queue is more than the number of CPUs, there is more demand for CPU resources. ldavg-1: “System load average for the last minute. 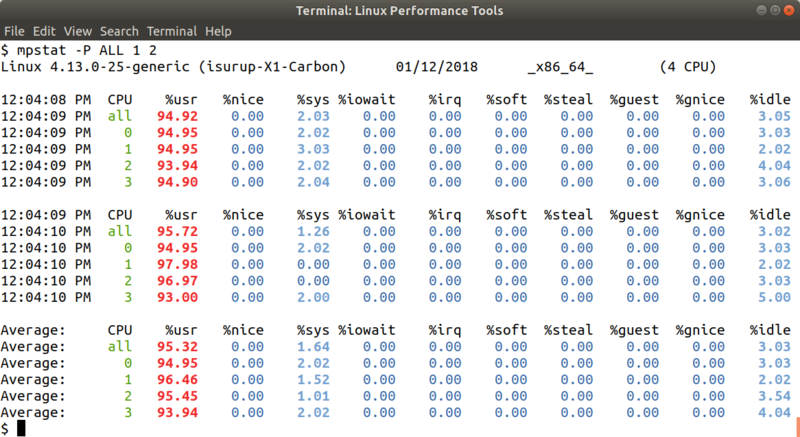 The load average is calculated as the average number of runnable or running tasks (R state), and the number of tasks in uninterruptible sleep (D state) over the specified interval. The command is “sar -S” to report swap statistics. In this example, “kbswpused” and “%swpused” are at 0 and it means that the system is not swapping. The “ss” command is available to get socket statistics. We previously looked at “netstat” command to get network connection details. The “ss” command is a replacement available for the “netstat” as the usage of “netstat” is now deprecated. The “ss” command is also faster and capable of displaying more information than the “netstat” command. The “ss” command by default lists all open non-listening established TCP, UDP and UNIX socket connections. Following are some important options. Using -p option to view the process name and process ID. Use -m option to view socket memory usage. The “ss -tlnp” can be used to quickly view all TCP servers running in your system. 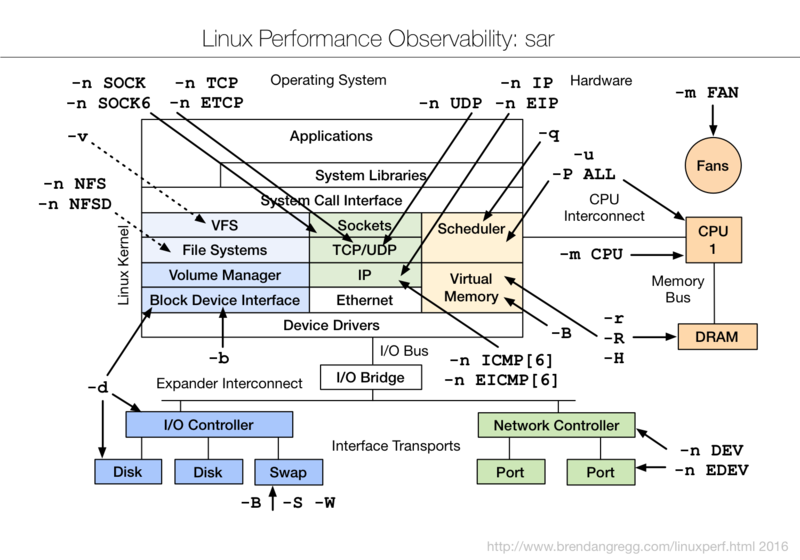 This story covers some of the popular Linux Performance Observability Tools available. Use this as a quick reference guide (cheat-sheet), but always check the manual pages as these tools are keep getting updated.